Free eBook Oct. 27 – 31, 2018. Halloween costume & career ideas. 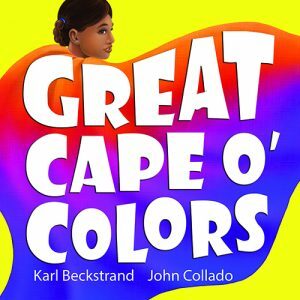 “A magic cape” picture book exploring colors—and jobs—with full text & pronunciation guide in both languages (ages 3+/ESL). Count careers/colors/cultures! Black & Hispanic superheroes, 100 words (English, Spanish, or bilingual 200) in dyslexic-friendly font by award-winning author Karl Beckstrand, illustrated by John Collado; #4 – Careers for Kids series: PremioBooks.com; 28 “bright illustrations.…excellent for teachers.” – Maritza Mejia, author/educator.